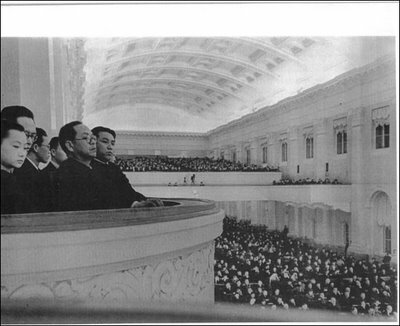 Son Seok-chun, former member of Hankyoreh editorial board and a current occasional writer for the paper, tells in his latest column about stories of rehabilitation (see the same text with comments also in his blog) in DPRK of Pak Hon-yong (Pak Hôn-yông), the Southern-born communist leader who went over to the North before the establishment of separate states, was a member of the early DPRK leadership and was given the responsibility for the failures of the Korean War and executed in 1955 for having been a "spy for the American imperialists". Chun, whose good faith in DPRK is unwavering, quotes Pak Hôn-yông's son, the buddhist monk Wongyeong who lives in ROK, that Pak's grave in the North would have been made into a kind of a memorial park. Wongyeong would have heard about this from northerners who've visited Yenbien. In one sense, this is unbelievable and unconceivable. Rehabiliting Pak Hôn-yông would mean admitting the fallibility of the Party and the Leader (Kim Il-sung), and as much as people of good faith like Son would like to believe that DPRK has changed so much as to admit that Kim Il-sung and the Worker's Party has been wrong, I see nothing pointing to that. Son remarks that there've been many cases in the history of communism that the mistakes of the party have been corrected. Sure, but they've been after major overhauls in the leadership and easening of dictatorship and totalitarianism, but where is that in DPRK? A secret speech of the new leader in the party congress condemning the "excesses" and "breaches of people's democratic legalism"? Stalin's son (did he have one?) didn't continue his father's rule. This also leaves me thinking that there might be some good disinformation spreading going on, especially as Son conveys the claim that rehabilitation of Pak Hôn-yông would have been ordered by Kim Il-sung "just before he closed his eyes" (yes, Son writes like that, 눈감기 직전에 내린 명). On the other hand, wouldn't it be good news if DPRK really would be rehabiliting Pak Hôn-yông and abandoning the infallibility of the two Kims (father and son) and the Party? (Where does that leave the army?) Unification must be right around the corner! Moscow, March 1949: Pak Hôn-yông in the middle wearing glasses, Kim Il-sung to his left (notice how I've chosen the photograph to convey a certain impression of Pak). Photograph from "Korean War in Photographs" serial in Ohmynews. Does Pak Hôn-yông deserve reassessment? Perhaps he deserves credit for pro-independence activity during the colonial period, but his participation in the creation of the DPRK dictatorship and his responsibility for the Korean War should discredit him for any role in the improvement of South-North relations, as the columnist Son seems to wish. For someone like Son Seok-chun who gets so elated just for the thought of "revolution", Pak Hôn-yông is laudable only for having been a revolutionary, dictatorship nonwithstanding. Others, like me, will prefer dictatorship and dictatorial ideology as the basis of assessment. 북한의 대남 선전사이트인 에서만 (http://ndfsk.dyndns.org/) 여태까지 박헌영을 언급할 때마다 "간첩"이란 말이 나옵니다. 김일성의 업적 중에도 하나는 52년의 박헌영 간첩단의 적발이기도 합니다. 이것을 조선민주주의인민공화국이 갑자기 남조선과 관계를 개선하기 위해서 재평가하겠습니까? 김일성의 아들임으로 지도자가 된 김정일은 아버지가 적발한 간첩이 그게 아니라고 선언하겠습니까? 당의 오류를 바로잡은 경우가 공산주의 역사에서 많다고 하시는데, 그런 사례들은 큰 변화가 있은 다음에만 가능했었지요. 예를 들면 스탈린 이후의 흐루쉬체브의 56년의 스탈린의 만행을 규탄한 연설이나 소련을 개혁하고자 했던 고르바초프의 경우엔 그랬었지만 북한에서 그런 것이 가능하지 못 합니다. In the North Korean propaganda site against the South, "National Saving Front", Pak Hôn-yông's name has this far not been mentioned without the adding "spy" to it. And one of Kim Il-sung's deeds has been to detect Pak Hôn-yông's spy ring in 1952. Would the Democratic People's Republic of Korea reconsider this in order to improve relations with South Korea? Would Kim Jong-il, who became a leader for being his father's son, declare that the spy his father caught wasn't that? You said that there had been cases in the history of communism where the party has corrected its mistakes. Those cases have always taken places after big changes. It's been the case for example in Khrushchev's secret speech in '56 condemning Stalin's misdeeds or in Gorbachev's attempts to reform Soviet Union, but that won't be possible in North Korea. That certainly would be very big news, but like you I'm very sceptical. Have there been any previous similar cases? I doubt it somehow. The current context in the DPRK is so completely different to the USSR in the 1950s. I'm also sceptical about the idea of Pak being a revolutionary. As with Kim Il-sung this is a difficult claim to make when there was never actually any revolution in North Korea and Pak and Kim both seem to think that socialism arrived on the back of Soviet tanks in August 1945. However, I would like to read more about Pak and his life and ideas at some point, and perhaps evaluate the claims of all these people who seem to think that he (unlike Kim Il-sung) was a 'real communist'. Linguistic note: rehabilitate/rehabilitation is the usual word used for this sort of thing. "Rehabilitate"; I knew it was something else than what I originally wrote, but I couldn't remember it. Actually the word is used often in Finnish as well (rehabilitoida). Thanks, I've corrected the note. Antti, like you and Kotaji, I am very skeptical... NK is changing, but not to such extent perhaps. For decades all NK people have been repeatedly told that PHY was an American spy, Japanese police agent and traitor. He is way too (in)famous to have a "reabilitatsija" (I believe that the use of this particular word in this sense reflects its Soviet-Russian origins, so Russian transcription is most suitable). Even now some South Korean leftist "historians" try to prove that he indeed was a spy. I do not think PHY will be officially claimed innocent as long as the Kims run the country. Even in the USSR during de-Stalinization campaign of the late 1950s the government did not admit that Bukharin and other victims of the Moscow trials (the closest equivalents of PHY) were innocent. Until the collapse of the USSR, a good Soviet citizen was supposed to believe that Bukharin and Trotsky were Hitler's spies! Slightly aside, I have recently found some evidence, from two independent sources, that back in 1953 Moscow tried to save PHY. However, in North Korea over the last decade of so there have been a few cases of "reabilitatsija" of some minor people who once became victims of purges but now are now mentioned in the official histoy books as if nothing happenned to them. Han SOl-ya is one example of such new trend. I've heard that it is OK now to mention Ch'oe SUng-hUi, the famous dancer. But not PHY. He is #1 villain. Sorry! Forgot to sign, it was Lankov! Han SOl-ya is one example of such new trend. I've heard that it is OK now to mention Ch'oe SUng-hUi, the famous dancer. But not PHY. He is #1 villain. Now that you mention this, I had to make a quick google for kcna.co.jp, and found that the "remains" of Han Sol Ya and Choe Sung Hi (*) among 22 patriots (ryôlsa) were placed in the Patriots' Tomb (Aeguk Yôlsarûng) in February 2003. But this leaves us wondering whether Mr Son who wrote the column is being naive in his belief in info that comes out of North Korea or whether he's doing cynical propaganda, knowing that there's no way KJI would deprive his father of one his great deeds. I'm inclined to think it's the latter. Just to get the record straight in relation to the "reabilitatsiya" process in the former USSR - yes, neither Bukharin nor Trotsky were formally rehabilitated in the mid-1950s, during the first de-Stalinization wave, but nobody considered them "fascist spies" after the official condemnation of Stalin's crimes in 1956. You can look at the last Soviet edition of Lenin's Complete Works (I think it was published in 1960s or 1970s) - Bukharin or Trotsky are referred to as first-generation Bolsheviks AND "deviationists" there, but their "fascist" connection in nowhere to be found. Bukharin (but, for many reasons, not Trotsky) was, in fact, half-rehabilitated in the minds of a large part of the late Soviet liberal intelligentsia. In relation to the historical memory, N.Korea is, in fact, much harsher place than the old USSR ever was. Well, the old official accusations were not repeated after 1956, it's true. But the accusations were not officially proclaimed wrong either. It is well known that in 1962 an official told Biharin's widow: "he was not a spy, of course". However, it was an unofficial statement, and we are talking about official position of the state, both in regard to PHY and Buharin. This position did not change, even though for all practical purposes the Moscow trials were seldom even mentioned in the officil press since the early 1960s. In regard the statement that "Bukharin ... was, in fact, half-rehabilitated in the minds of a large part of the late Soviet liberal intelligentsia", it's sort of understatement. I'd say, "in minds of majority" or even even "overwhelming majority" of the late Soviet liberal intelligentsia.